The video begins with a nighttime view of the Small and Large Magellanic clouds, satellite galaxies of our Milky Way. It then zooms into a rich star-birth region in the Large Magellanic Cloud. 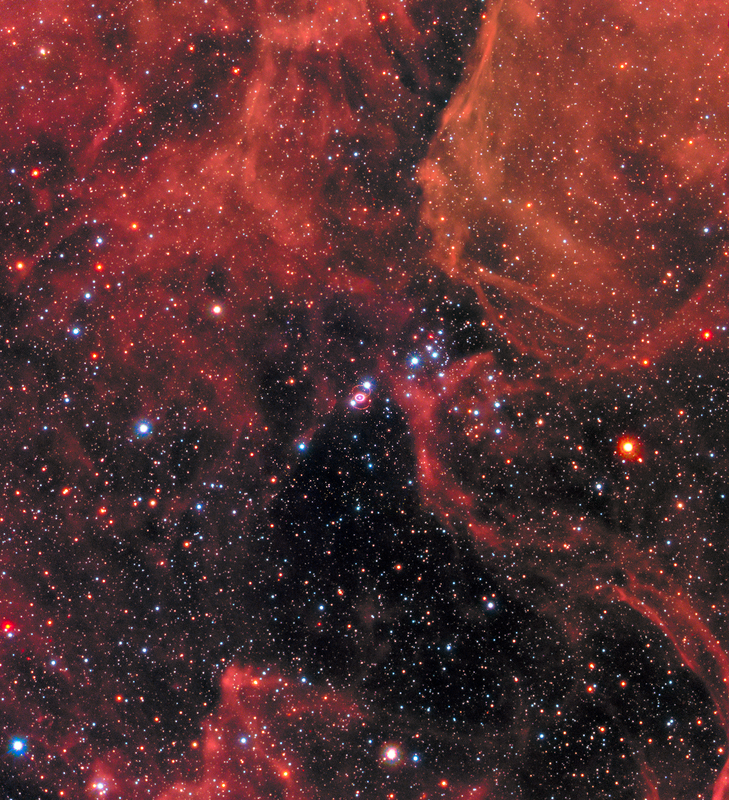 Nestled between mountains of red-colored gas is the odd-looking structure of Supernova 1987A, the remnant of an exploded star that was first observed in February 1987. The site of the supernova is surrounded by a ring of material that is illuminated by a wave of energy from the outburst. Two faint outer rings are also visible. All three rings existed before the explosion as fossil relics of the doomed star’s activity in its final days. To commemorate the 30th anniversary of SN 1987A, new images, time-lapse movies, a data-based animation based on work led by Salvatore Orlando at INAF-Osservatorio Astronomico di Palermo, Italy, and a three-dimensional model are being released. By combining data from NASA’s Hubble Space Telescope and Chandra X-ray Observatory, as well as the international Atacama Large Millimeter/submillimeter Array (ALMA), astronomers — and the public — can explore SN 1987A like never before. This time-lapse video sequence of Hubble Space Telescope images reveals dramatic changes in a ring of material around the exploded star Supernova 1987A. The images, taken from 1994 to 2016, show the effects of a shock wave from the supernova blast smashing into the ring. The ring begins to brighten as the shock wave hits it. The ring is about one light-year across. “The 30 years’ worth of observations of SN 1987A are important because they provide insight into the last stages of stellar evolution,” said Robert Kirshner of the Harvard-Smithsonian Center for Astrophysics in Cambridge, Massachusetts, and the Gordon and Betty Moore Foundation in Palo Alto, California. The latest data from these powerful telescopes indicate that SN 1987A has passed an important threshold. The supernova shock wave is moving beyond the dense ring of gas produced late in the life of the pre-supernova star when a fast outflow or wind from the star collided with a slower wind generated in an earlier red giant phase of the star’s evolution. What lies beyond the ring is poorly known at present, and depends on the details of the evolution of the star when it was a red giant. “The details of this transition will give astronomers a better understanding of the life of the doomed star, and how it ended,” said Kari Frank of Penn State University who led the latest Chandra study of SN 1987A. Supernovas such as SN 1987A can stir up the surrounding gas and trigger the formation of new stars and planets. The gas from which these stars and planets form will be enriched with elements such as carbon, nitrogen, oxygen and iron, which are the basic components of all known life. These elements are forged inside the pre-supernova star and during the supernova explosion itself, and then dispersed into their host galaxy by expanding supernova remnants. Continued studies of SN 1987A should give a unique insight into the early stages of this dispersal. Hubble studies have revealed that the dense ring of gas around the supernova is glowing in an optical light, and has a diameter of about a light-year. The ring was there at least 20,000 years before the star exploded. A flash of ultraviolet light from the explosion energized the gas in the ring, making it glow for decades. In the past few years, the ring has stopped getting brighter in X-rays. From about February 2013 until the last Chandra observation analyzed in September 2015 the total amount of low-energy X-rays has remained constant. Also, the bottom left part of the ring has started to fade. These changes provide evidence that the explosion’s blast wave has moved beyond the ring into a region with less dense gas. This represents the end of an era for SN 1987A. Beginning in 2012, astronomers used ALMA to observe the glowing remains of the supernova, studying how the remnant is actually forging vast amounts of new dust from the new elements created in the progenitor star. A portion of this dust will make its way into interstellar space and may become the building blocks of future stars and planets in another system. These observations also suggest that dust in the early universe likely formed from similar supernova explosions. The Chandra program is managed by NASA’s Marshall Space Flight Center in Huntsville, Alabama, for NASA’s Science Mission Directorate in Washington. The Smithsonian Astrophysical Observatory in Cambridge, Massachusetts, controls Chandra’s science and flight operations. Can Trump resist the power of behavioral science’s dark side like other politicians?